By the time the cops arrive, the violence is usually over, and the perpetrator is already long gone. Only in a small percent of cases (anybody have a documented number?) do they arrive in time to protect us from being criminally violated. They protect us mostly in a very general sense, but patrolling and locking up some criminals (for which we are most appreciative and pay taxes). If you want real DEFENSE (protection against a specific criminal act which is about to transpire), organize your own community watch and defense plan (which should be more than calling 911), arm and train yourself, have your defensive weapon readily available (lock it if minors are in the house), and have a pre-developed plan of defense for any situation you can imagine. As a recent A-C-E post noted, some greater Atlanta communities are paying for their own private police forces, since the tax-paid police services have proven inadequate to prevent crime. That helps, but the members of a community need to be armed and ready to help themselves or their neighbors. Signs so indicating might persuade the bad dudes to drive on a little further to another, more passive, neighborhood. When ACE was a kid (a looong time ago), everyone knew their neighbors, even in Atlanta suburbs. Neighbors watched for suspicious activity by strangers. That sense of community has been lost in large part, for a number of reasons. It's time to bring it back. Saw a muscle tee like this at a Fourth of July party in Avondale, GA (one of the first planned communities in the US, about seven miles from downtown ATL), and it cracked me up, but it makes a good point. Thanks to Chad Crayton @ 13 Crows for linking to this post. Visit his blog for some interesting and beautfiful images. 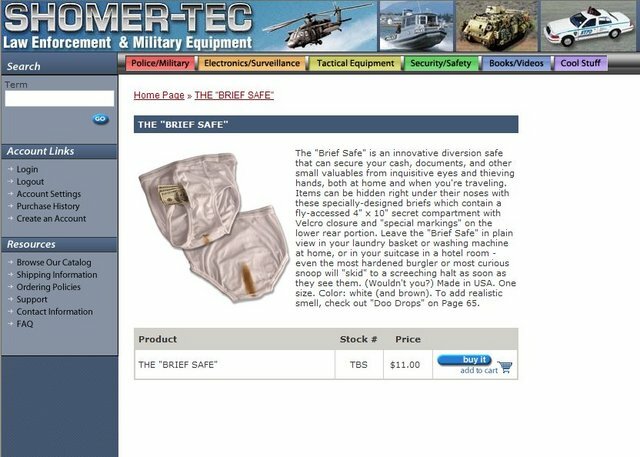 Cowboy Blob found an interesting (if a bit disgusting) product called a briefsafe. I wouldn't go look if I were you. When did the Army hire Kerry to design its ads? As a commenter notes, that's MarPat camouflage...Ugh's a Jarhead! ... redneck style, at Cowboy Blob's. Terrorists, nukes & oil? How about Women's Suffrage? Students tend to be on the forefront of social reform. The video at the link shows how some are being proactive in eliminating this very dangerous concept. Private Murphy by Mark Baker. Military Cartoon Center at Military.com. ... a concept adapted from the ancient Trojans and Romans, using stronger modern materials. A new reinforced concrete Stryker urban warfare fighting platform (the acronym is SAKRETE but the words represented by the letters are classified) has debuted in Mosul, culminating a top-secret development program. Check out this image of it slowly rolling down a street of Mosul with gunners on the ready and the Commander on the upper bridge (a feature adapted from WWII battleships), checking the street map. Note the duel bridges and some retention of the anti-RPG grating. The antenna to the left is for the advanced wireless communication system. This image shows the vehicle in stationary position, with concrete slabs hiding the large, rubberized rollers and the undercarriage, making it look like a typical building. Critics are claiming the SAKRETE does meet air transport specifications, but, hey, the original Stryker doesn't (quite) either. Those are just bureaucratic details. And, after all, who's fault is it that the AF doesn't have big enough planes? If it gets the job done on the ground, so what? We'll find a way to get it there. OK, don't have a tizzy and write chastising comments. Have to interject a little humor now and then, even during a war. And, no, I'm not counting on winning any awards for humorous blog sites. As of this posting, the weekly hit rate is 12,773 hits/wk (down a tad from the 13K record set yesterday, but the day is young.) Thanks for visiting, linking, and commenting (on topic, w/o leftist moonbat rambling). They need to learn how to stand way back behind the plane to make it appear full size, like the guy in South Georgia did with his claimed 1-ton hog. I'm surprised they've not been able to shoot down at least one chopper by now. They did hit one, but it limped back to base. 1138Z THU 11NOV04. The Jawa Report. The leading design hurled an 8-10 lb. pumpkin 4,224 feet [0.8 miles exactly] before a crowd of about 40,000 in Sussex County, DE [the part of the state below the C&D canal which is affectionately called "Slower-ware"]. Don't bring a donkey to an elephant fight. 1115Z SAT 06NOV04. Luckovich. AJC.